Thoughtfully presented to an exacting standard throughout, a large DETACHED FAMILY RESIDENCE offering genuinely SPACIOUS accommodation with a STUNNING leisure annex incorporating a large indoor SWIMMING POOL. The property lies on an impressive 0.64 acre plot, benefits from FOUR BEDROOMS and five bathrooms. 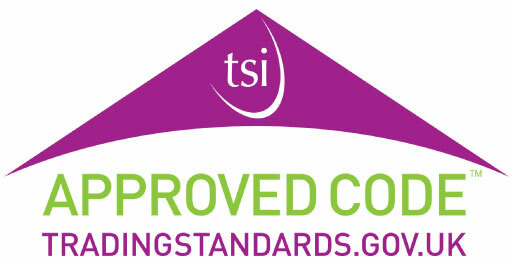 EPC rating D68. Thoughtfully presented to an exacting standard throughout, a large detached family residence offering genuinely spacious accommodation with a stunning leisure annex incorporating a large indoor swimming pool. 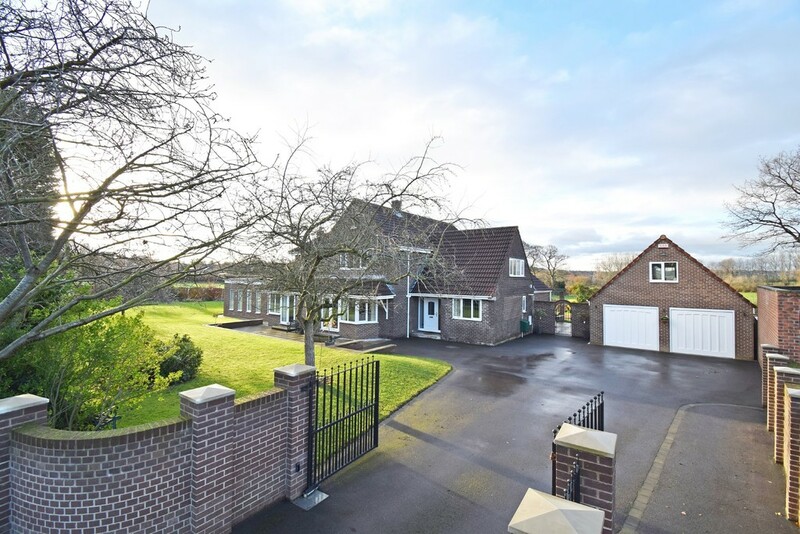 Belying a modest external appearance, this enviable family home sits on a plot extending to around 0.64 acres (0.26 hectares) in one of the most desirable positions in fashionable Sandal. A generous reception hall provides a stylish welcome and acts as a central hub to all the principal rooms. There is a lovely sitting room with French doors to a sizeable patio area, which, despite being at the front of the house, enjoys a good degree of privacy. There is a similarly well proportioned living room that also has French doors to the front patios and gardens beyond. A separate formal dining room, an office and a guest w.c. are also situated off the reception hall. The kitchen and adjoining dining area are a particularly strong feature of the house, fitted to an excellent standard, with a full range of integrated appliances and granite worktops. Adjoining the dining area is a perfectly relaxing snug. An inner hallway then leads through into a substantial leisure annex that boasts a large indoor heated swimming pool with associated changing, shower and plant rooms together with a gorgeous well proportioned sun room with a lantern roof and wide bi-folding doors to the patio and gardens beyond. The property is approached via automated gates from the lane, which open into a generous parking/turning area that in turn leads into a substantial detached garage block with ancillary accommodation to the rear and first floor. Sweeping lawns with mature beds and borders lead round the front of the house to an orchard and further substantial lawned garden to the side, whilst to the rear there is a wonderful entertaining area with ample patio space, a pergola, gazebo and large lawned gardens taking full advantage of the southerly views over the neighbourly fields. This perfect family home is situated in one of the most desirable positions in the highly regarded area of Sandal. Local shops, schools and recreational facilities are close at hand and Wakefield city centre is around three miles to the north. Junction 39 of the M1 motorway is two miles to the west, ideal for the commuter requiring the motorway network. OPEN ENTRANCE PORCH WAY Tiled step and courtesy ceiling light. Double glazed UPVC door leads to the reception hall. RECEPTION HALL 27' 2" x 6' 6" (8.3m x 2.0m) average Generously proportioned with a staircase to the first floor, two central heating radiators, built in storage cupboard and acting as the central hub to the house with access to all the principal downstairs rooms. DOWNSTAIRS W.C. 5' 6" x 4' 7" (1.7m x 1.4m) With fully tiled walls and floor. Fitted with a contemporary white and chrome cloakroom suite comprising low suite w.c. and pedestal wash basin. Window to the side, extractor fan and chrome ladder style heated towel rail. SITTING ROOM 19' 0" x 11' 9" (5.8m x 3.6m) plus a deep bay to the front Ornate fireplace with a marble insert and hearth housing a living flame coal effect gas fire. Two wall light points, ornate coving to the ceiling, built in double fronted storage cupboard, double central heating radiator and French doors to the bay leading out to the patio area at the front. LIVING ROOM 24' 7" x 10' 5" (7.5m x 3.2m) Feature fireplace with an ornate surround, marble insert and hearth housing a living flame coal effect gas fire. Two double central heating radiators, two wall light points and French doors to the bay to the front. DINING ROOM 16' 4" x 15' 8" (5.0m x 4.8m) Feature fireplace with an ornate surround, marble insert and hearth housing a living flame coal effect gas fire. Double central heating radiator, two wall light points, coved ceiling, French doors to the rear patio and a door to useful storage room, which also houses one of the gas fired central heating boilers. OFFICE 11' 9" x 8' 6" (3.6m x 2.6m) With a window to the front and double central heating radiator. DINING KITCHEN 19' 8" x 19' 0" (6.0m x 5.8m) Fitted to an exquisite standard with a beautiful range of painted wall and base units having granite worktops incorporating an inset 1 1/2 bowl stainless steel Franke sink arrangement in addition to a further inset Franke preparation sink. A Rangemaster cooker with a five ring gas hob plus further hot plate, two double and one single ovens, grill and a concealed filter hood above. Integrated tall fridge and separate matching freezer, built in microwave, built in steam oven, built in glass fronted wine cooler, integrated washing machine and integrated dishwasher. Kickspace heater, vertical contemporary central heating radiator, quality engineered oak flooring, windows and French door look out on the patio to the rear of the house and gardens beyond. Leading to the adjoining snug area. SNUG AREA 11' 1" x 10' 5" (3.4m x 3.2m) Feature fireplace with a contemporary style wooden surround with a black marble inset and hearth housing a coal effect gas fire. Matching wood strip flooring, French doors to the patio and provision for a wall mounted television. INNER HALLWAY Providing access through to the leisure annex with connecting doors to the swimming pool area, sun room and shower room/w.c. all benefitting from a zoned underfloor heating system. SHOWER ROOM/W.C. Fully tiled walls and floor. Fitted with a three piece white and chrome suite comprising shower cubicle with thermostatic shower, pedestal wash basin and low suite w.c. Connecting door through to the pool area. POOL AREA 40' 4" x 38' 8" (12.3m x 11.8m) maximum An irregular shaped room with a kidney shaped indoor heated pool, tiled floor, windows to three sides and an advanced heat recovery/humidity control system to maintain a comfortable atmosphere. Bi-folding doors lead through into the adjoining sun room. PLANT ROOM Housing the filtration system and gas fired heating for the swimming pool and underfloor heating system. CHANGING ROOM Triangular shaped changing room off the swimming pool area. SUN ROOM 23' 11" x 23' 3" (7.3m x 7.1m) Bi-folding door arrangement out onto the rear patio, windows to two further sides and a lovely lantern style roof. Ceramic tiled floor with underfloor heating. FIRST FLOOR LANDING Offering a good degree of circulation space with a loft hatch giving access to a boarded loft, two central heating radiators and a walk in airing cupboard that also houses the insulated hot water cylinder. MASTER BEDROOM 19' 0" x 12' 1" (5.8m x 3.7m) Window to the front overlooking the garden, two wall light points, double central heating radiator and a broad range of quality fitted wardrobes with drawer units under and further drawer unit. EN SUITE/W.C. 10' 9" x 5' 6" (3.3m x 1.7m) Attractively finished in a contemporary wet room style with tiled walls and floor with electric underfloor heating. Fitted with a white and chrome suite comprising low suite w.c. with concealed cistern, matching wash basin set in a vanity unit and a walk in shower area with a large fixed glazed screen. Chrome ladder style heated towel rail, extractor fan and a window to the side. DOUBLE BEDROOM TWO 20' 0" x 11' 5" (6.1m x 3.5m) Window overlooking the rear garden and fields beyond. Fitted with a broad range of quality wardrobes with matching drawer units and dressing table. Double central heating radiator and connecting door to the en suite/w.c. EN SUITE/W.C. 7' 10" x 7' 2" (2.4m x 2.2m) Part tiled walls, central heating radiator, window to the rear and fitted with a four piece suite comprising panelled bath, separate shower cubicle with twin head shower, pedestal wash basin and low suite w.c. Central heating radiator and extractor fan. DOUBLE BEDROOM THREE 12' 9" x 11' 1" (3.9m x 3.4m) Window to the side, central heating radiator and a connecting door through to the en suite/w.c. EN SUITE/W.C. 10' 9" x 5' 6" (3.3m x 1.7m) Fitted with a four piece white and chrome suite comprising panelled bath with shower attachment over, separate walk in shower cubicle with sliding screen and electric shower, pedestal wash basin and low suite w.c. Fully tiled walls, chrome ladder style towel rail, window to the side and extractor fan. DOUBLE BEDROOM FOUR 13' 1" x 10' 2" (4.0m x 3.1m) Characterful sloping roof line and a window to the side, double central heating radiator and a range of fitted wardrobes with matching dressing table. Two wall light points. FAMILY BATHROOM/W.C. 11' 5" x 7' 2" (3.5m x 2.2m) Two windows to the side and fitted with an attractive white and chrome four piece suite comprising panelled bath, separate shower cubicle, pedestal wash basin and low suite w.c. Fully tiled walls, chrome ladder style heated towel rail and extractor fan. OUTSIDE The property stands in a plot of 0.64 acres and is approached via electric gates, which leads to a wide parking/turning area that in turn leads to the detached garage block. Attractive lawned garden with mature shrubs, trees and borders to the front of the house as well as a patio that enjoys a lovely degree of privacy. The gardens lead round the side of the house where there is a further expansive lawned area as well as an orchard. With a lovely southerly aspect, the principal gardens lie to the rear of the house where there is a further expansive lawned area with mature beds and borders. A large patio area flows out from the sun room, kitchen, snug and dining room. There is an attractive pergola that creates a wonderful outside dining space next to the kitchen and dining room, as well as a separate gazebo in the far corner of the rear garden. GARAGE BLOCK To the ground floor, a double garage (measuring 20' 4" x 18' 0" / 6.2m x 5.5m) with twin automatic doors to the front, window to the side and connecting door through to the storage area to the rear. The store room (measuring 20' 4" x 6' 10" max / 6.2m x 2.1m) has a window to the rear, tiled floor and incorporates a garden w.c. with low flush w.c. and corner wash basin. The first floor (measuring 25' 7" x 12' 9" / 7.8m x 3.9m) has a characterful sloping ceiling, windows to the front and rear, loft access hatch and access to eaves storage cupboards. This room lends itself to a variety of purposes including games room/playroom, separate home office or even has potential for providing separate sleeping accommodation subject to gaining the usual necessary statutory consents.